After booting up from your install disk, you will arrive at a language and preferences screen. 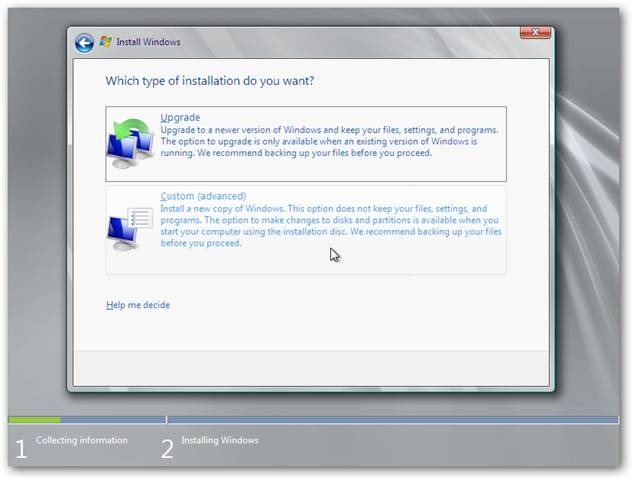 Once you have chosen those options, you get to the Operating System Selection page. Depending on your license and the purpose of your server, there are a variety of options to choose from. For our purpose today, we are going to choose the Enterprise (Full Installation) version. 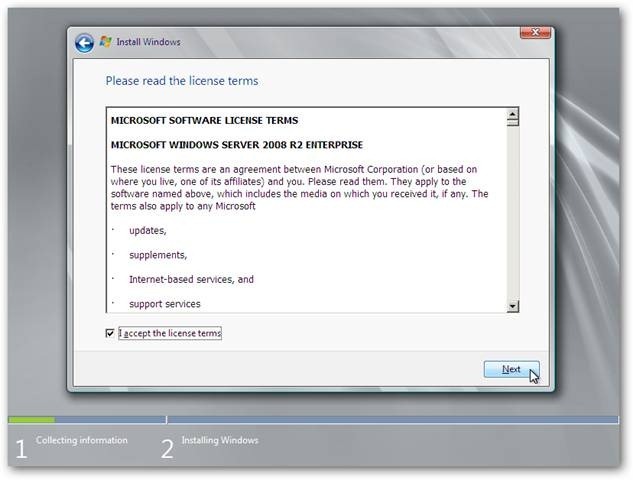 We get to read the standard End User License Agreement. Since we’re doing a base install and not an upgrade, so we choose the Custom (advanced) option. If you want to create a partition out of the available drive space or reformat a drive, then choose Drive options (advanced). Windows will take a little while with your install, and reboot a few times. Once the install is finished, we’re prompted to change our password before logging in. 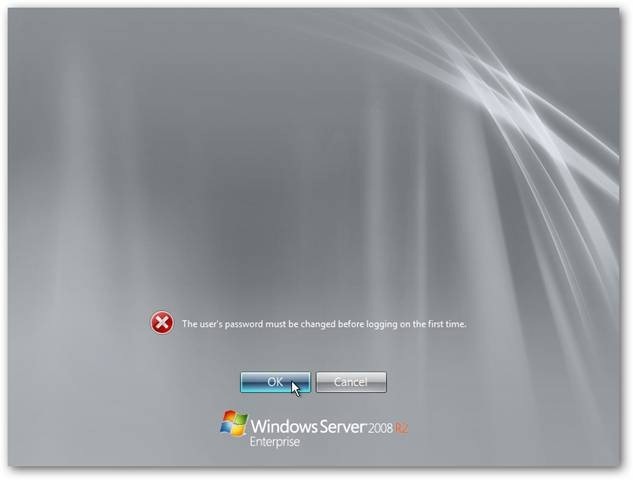 Windows requires that you have a strong password, seven characters long with at least three of the four following: uppercase letter, lowercase letter, numeral, or symbol. 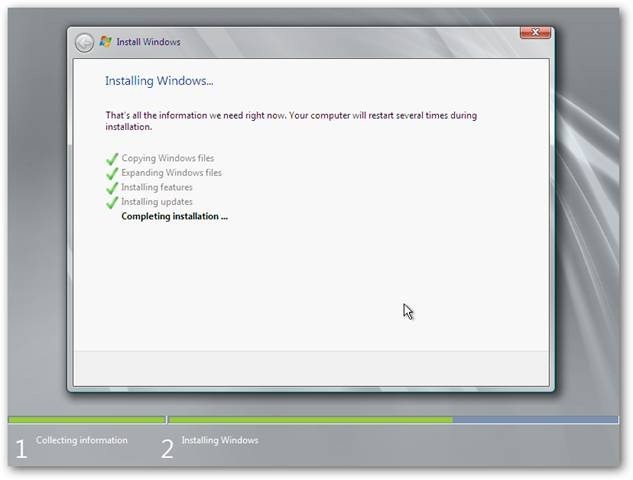 You’ll want to make sure you write it down somewhere for now, because if you forget it later, the entire install will have to be re-done. 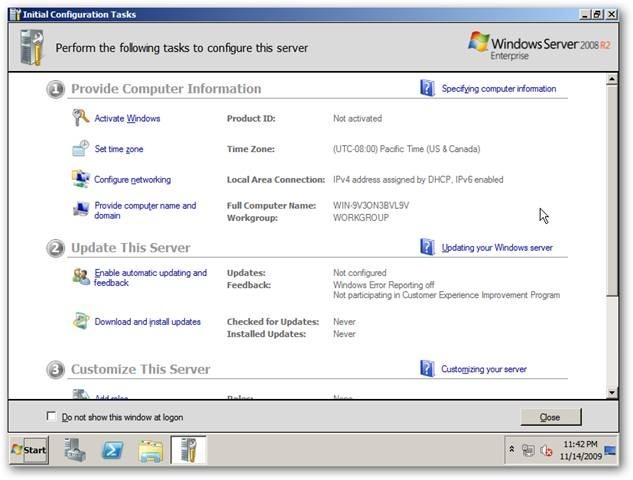 The Initial Configuration Tasks window pops up as soon as you logon. You could also type in Oobe.exe in the Command Prompt to arrive here. 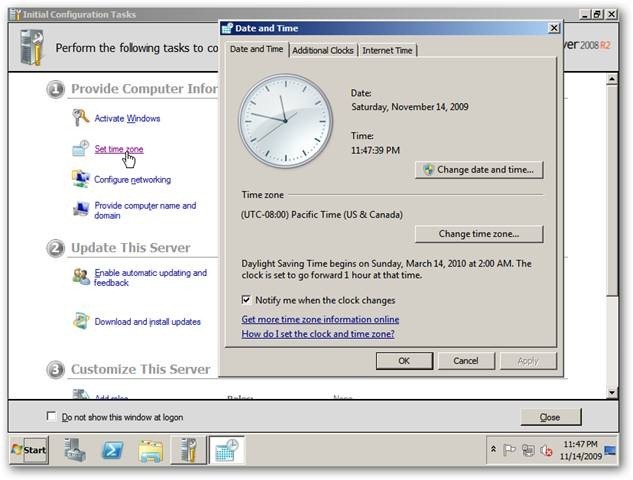 One of the first things we want to correct is the time, so choose Set time zone. Make sure that you set the time zone first, because the the date and time will shift after. Next we want to choose Configure Networking. 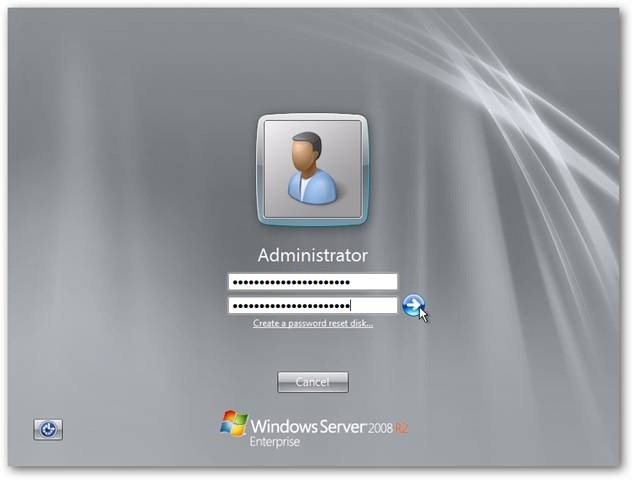 The first server installed in a network needs to be a Domain Controller, and since they require a static IP, you will need to set one up now. Double-click on Local Area Connection, and once the information box pops up, click on Properties. 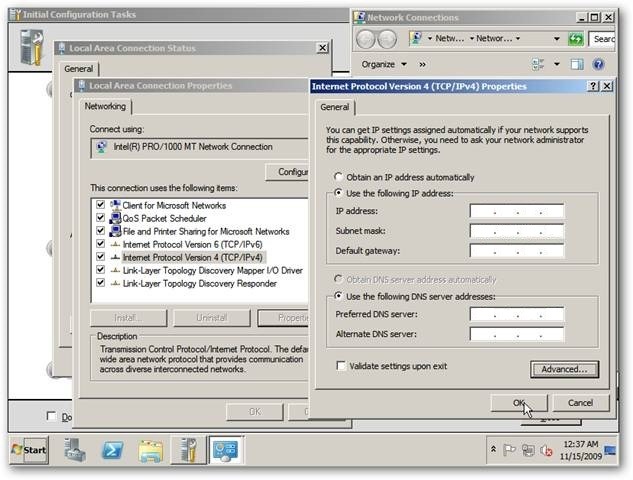 Click on Internet Protocol Version 4 in the Networking box, then click Properties. 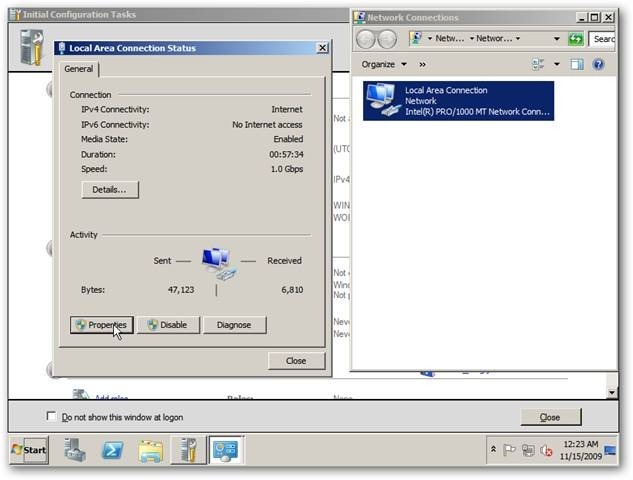 Change the radial button to Use the following IP address: and then enter the settings for your specific server and network IP addresses. When you’re finished, click OK to save those settings. 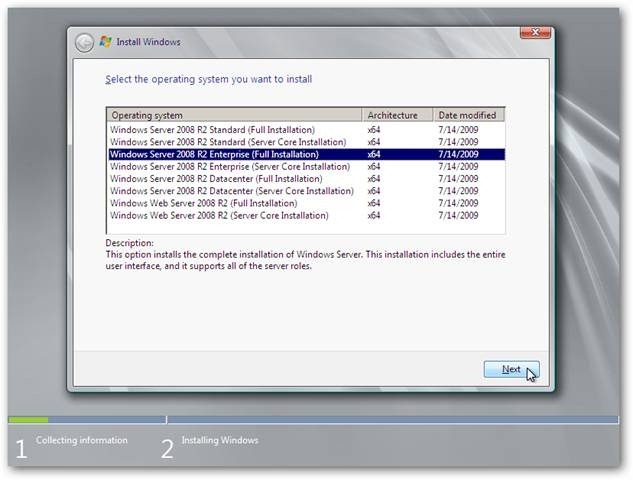 That completes the installation for Windows 2008 R2 Server.